Six sister weeklies have removed all editorial content from their websites in a bid to drive traffic to their social media channels. The move by the newspapers, which are all owned by Johnston Press, came into effect yesterday. 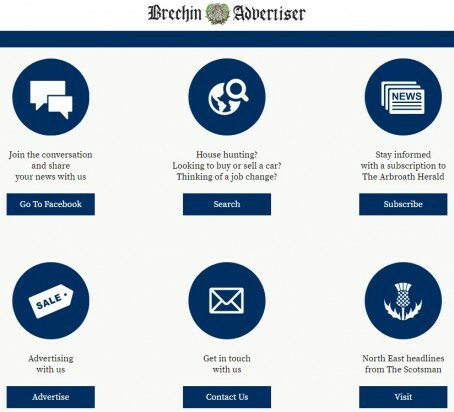 Readers visiting the websites of the Arbroath Herald, Brechin Advertiser, Forfar Dispatch, Guide & Gazette, Kirriemuir Herald and Montrose Review are now instead greeted with a homepage offering six different options. Links allow visitors to go directly to the relevant title’s Facebook page, subscribe to the newspaper and email its staff. Readers are also directed to The Scotsman’s website for North-East of Scotland news stories and advertising enquiries, while another link allows them to search for property, motors, jobs and family announcements. The changes were unveiled in an announcement made across the titles’ Facebook pages on Saturday. It states: “We’re making some changes next week, which we hope will provide you with a better paper and a chance to engage with us more on our social media platforms. This was followed up by a further announcement on Monday, which reads: “A reminder to our readers – we have now taken the decision to switch our focus away from our websites and on to our social media platforms, particularly Facebook. A spokeswoman for Johnston Press said: “We are currently exploring a number of digital options which allow our news teams to focus on providing the best news coverage – be it in print or online. “In some of our smaller areas we see social platforms as an effective way to stay connected to our readers. We want to focus resource on increasing engagement through those platforms in support of a quality print product. Is this the first sign that regional press websites are dead ducks and so publishers are putting their faith on social media likes and follows? First newspapers were allowed to wither and die now websites, they’re gradually running out of ways to self finance the business which must be alarming to those still employed there. Oh and please remind me how they’ll monetise their Twitter avd Facebook pages to sustain a huge business when copy sales and ad revenues have collapsed. I commented only yesterday that local advertisers don’t support local newspaper websites so this move doesn’t surprise me. The only reason for this is website revenue failure. This clutch of papers are all small operators cut to the bone with little room for sourcing news and heavily reliant on reader content and press releases which is the JP way. The danger here is why use a third party operator to view news on Facebook for example? Better to go direct to the source, the police, football club, community organisation. News is no longer under the control of newspapers which are starved of resources and losing ground in the new media world. Clicks are irrelevant because if advertising blocks/slows access to content the reader isn’t interested and will go elsewhere. Perhaps there is a clue in this story with the company pushing its big regional player into its smaller markets ahead of closures. There is a delicious irony in this. Personally, I wouldn’t touch Facebook with a bargepole, partly because of my ludicrously advanced years, but mainly because I don’t like its intrusiveness, cookies, content tracking and overall T&Cs. For journalists to be involved in using it as a main platform is distasteful to say the least. Awful idea which won’t generate revenue. Should have maintained their own sites. Better chance of monetizing. Can someone just clarify for me: do these six Scottish weeklies no longer produce a weekly “hard copy” edition of their titles; i.e. their only presence at the moment is their online (website) editions; and in future this will appear on Facebook instead? Just like webmonkey, this is something I’ve been discussing with people for a long time. As soon as Facebook Instant Articles, Google’s AMP articles and Apple News were developed, it was clear what their true goal was. ex-Buryite, all of these options allow you to keep 100 per cent of the advertising you sell and a percentage of the advertising they sell when you haven’t. Publishers can monetise their stories without having to spend money on hosting and maintaining their own websites. Surely that’s more effective. The real problem with this is it that it will further divide those who argue the journalist differences over ‘chasing page views’ and ‘quality’. Let me pick up on a couple of points. These are ”proper” weekly newspapers as I remember them from my days in the job. They are packed with local news and sport which I happen to know is locally sourced by a small but dedicated hard-working team of reporters under an old-school editor of huge experience, who uses press releases very sparingly. Perhaps that is why they have been chosen to spearhead this project? And, yes, they are still producing weekly hard copy editions. Hopefully they will reap some extra benefit from no longer putting editorial content on their websites. If it works then it could provide a model for the future – if not then it won’t be from lack of trying! If this move is for commercial/ financial reasons it would indicate they aren’t making money from their websites, are losing money in the printed publications with lack of advertisers not bringing sufficient sustainable revenues and now feel driving traffic from unpopular webpages to their social media sites to be the answer. if that’s the case how do they intend making money from social media free sites? I also wonder why anyone would go to their web pages if there’s no news on it? Little web traffic will surely further reduce the appeal to the potential advertiser so again limit the opportunities to monetise the web pages? What will be on the web sites and how do they intend to finance the business from social media traffic alone? I’m not familiar with the inner workings of Johnston’s Scotland titles so forgive me if I’m wrong, but this looks very much like consolidating and reducing their web presence to concentrate on a single, larger website. Presumably these weeklies also serve the Scotsman so by closing these websites, traffic will be focused on that site – hopefully increasing revenue. I’m not saying this approach will necessarily work but there is a certain logic to not saturating the market. I have a Facebook page. I use it fairly regularly. I’ve never received any kind of payment from the Facebook followers who read my posts. Please can someone explain to me how these papers will make money from this project? Oliver – the problem is that publishers can’t make money from the social media platforms. AMP performs better than FB Live, but even that yields reasonably poor returns. Publishers have no control over audience data and they are at the mercy of FB/Google etc changing their minds at any given moment. Long-term, it’s doomed to failure. Switching off websites and begging for cash. Just a normal week in Britain’s regional press. Seriously, this might be a sensible way forward and is worth a punt. It also clears the way for the Scotsman website. TM have shown that it’s probably not worth running small websites when programmatic revenues are just over four fifths of flog-all per view. I always thought they should have switched off the websites many many years ago. I hope with Facebook they will give a bit of a story and if you want more, buy the paper. I’ll be interested to hear if newspaper sales increase. If they end up putting all the stories in full on Facebook, they are doomed. There may be six titles involved, but it is basically two weeklies, one covering Forfar, Kirriemuir, Brechin and Montrose and the other Arbroath and Carnoustie. Is was done on the quiet some time ago, readers only becoming aware of the fact when their Forfar paper, for example, was full of news from Brechin and Montrose. All six were once jam packed with exclusively local news, that is until JP came along with the bright idea of converting the titles to meet the needs of its way of life – leading to crashing circulation figures and the need to merge some of the titles in the way it was done. Makes me wonder if newspaper websites will end up being rebranded ‘Spotted in’…..
As we all know – or, at least, should – these decisions are taken at the top and then passed down to busy news teams to make it work. In the good old days we had teams of reporters serving our different communities, with one editor per title. Now individual editors are tasked with managing a number of papers while coping with fewer and fewer staff. Whether six titles are now basically two weeklies is certainly not the fault of hard-pressed, under-resourced journalists struggling to cover their patch to the best of their ability. During 50 years in the business I encountered so-called editors who could barely handle one title, let alone multiple ones. In my opinion, decent editors are thin on the ground. These are good papers and deserve to succeed with this ground-breaking project. As fellow journalists, past and present, we should lend them our support. ex-buryite, I’m guessing FB Live was a typo and you meant Instant Articles? I don’t see what it matters about the frequent changes to Google and and Facebook. If I host a website with Microsoft or AWS, or print a newspaper without owning my own press, I’m at the mercy of other companies too. Also, none of them are really producers of content and they need publishers like JP etc for their own advertising models to work. Although this is likely to change, I suspect they’ll focus on live and on-demand TV channels for now. Each of the three main platforms mentioned have a USP. Google’s is search, Facebook’s is personal information and although Apple’s is a bit vague, you could say it’s the most popular mobile device. To me, it currently makes sense to do all three. Yes, AMP will get you high up in search which is exceptionally useful but the real money around this advertising model will be based upon ‘sharing’ content. That’s where Facebook will win hands-down! Doing nothing is doomed to failure. At least this is an option which may or may not be successful for regional and local news publishers. You’re quite right Oliver, I meant FB IA. Agree entirely that doing nothing is doomed to failure. However, enough large publishers have pulled out of IA and Apple News (although the model is slightly different as they are aiming to drive more people to subscriptions) to make me believe this is a warning flag. If the revenue was there, they’d have stayed. It isn’t!